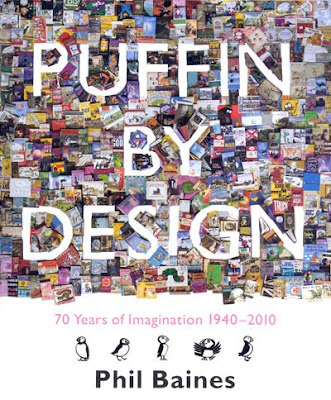 Puffin by Design is an exciting and colourful book, which celebrates the 70th anniversary of Puffin publications. Using the slogan "70 Years of Imagination", this book certainly doesn’t disappoint. The book takes a chronological approach, and by showcasing this timeline, it takes you through the evolution of the iconic publisher. After a chance meeting in 1939, between Allen Lane (Penguin Publisher) and Noel Carrington (Natural History Publisher), Puffin Picture Books was born. This changed the course of children’s publications forever, and the company went on to become the leading publisher for children’s literature. Much like Penguin, Puffin publications traditionally used the 3 horizontal stripe design for their book covers, which has become iconic with the brand. This book shows the development from the recognised design right the way through to exciting present-day covers. It documents the changes in typography, illustrative design and printing techniques over the past 70 years. This is a beautiful book that contains thought-provoking images that will take you back to lovely childhood memories of story time with the Hungry Caterpillar and unimaginable adventures with Alice in Wonderland. Puffin by Design contains a combination of visually stimulating images with written text documenting the role in which Puffin’s editors, illustrators and designers played in the development of the brand. Puffin by Design is a visual gem that allows you to follow Puffin throughout its ground-breaking history. This book will appeal to the masses, from collectors to designers to Puffin fans old and young - a great partner to the hugely popular Penguin by Design. Published in Peguin paperback 3 June, £20.